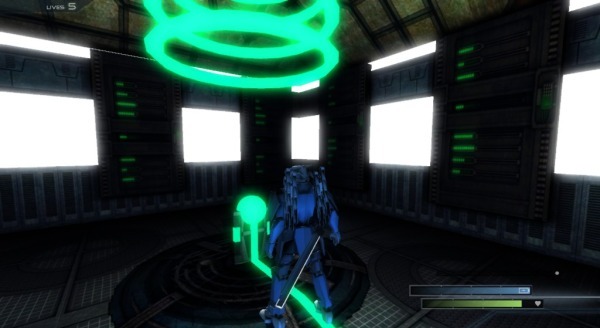 DragonSix brings the Xbox Cybernetic fast-paced character action game to Steam after being greenlit by the community, and it’s now here to test your skills in the beat ‘em ups genre. This is Proxy Blade Zero. The game doesn’t tell you a lot of its lore as it straightly takes you to a combat tutorial and then begin the Chapter missions. 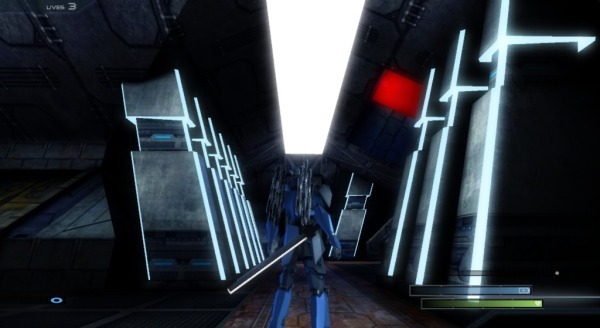 You play as a space samurai with speed booster on your back. 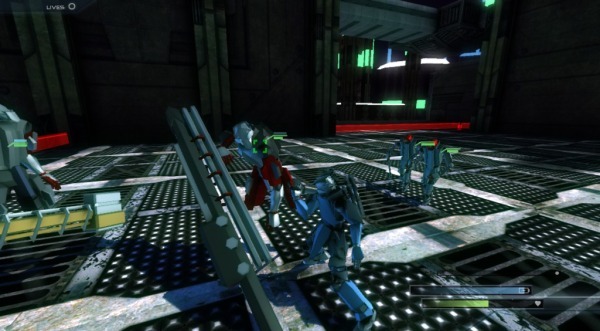 Your goal is to defeat robot grunts, solve light puzzles and take down the target. 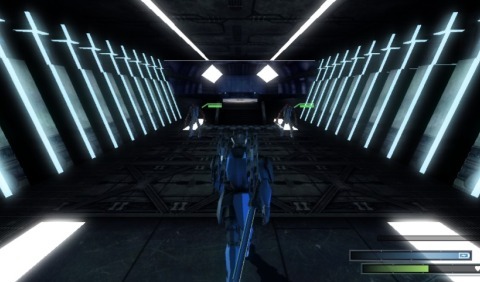 As you enter a chapter, you will find open areas that will obviously close the exits and spawn a certain number of enemies at you. These include regular robots with very few attack animations, bigger robots with laser cannons, even tougher robots with huge hammers, and many more. 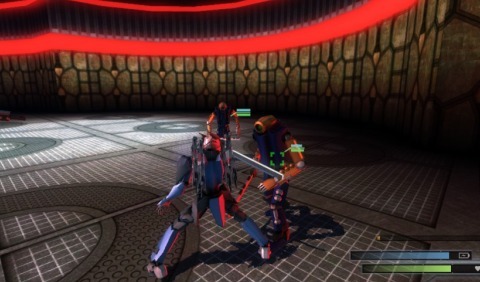 Difficulty can be rough for new players getting to know the genre, as enemies can take down many hit points. As the tutorial explains, you have one attack button which repeatedly can land a 3 hit combo, but the secondary button can allow you to make it longer as you press it in between the consecutive attacks or mainly whatever pattern you would press it, be wary that if not pressed properly during a combo it will just make your character still and an easy target. Your boost button makes the player hover fast over the scenario bringing a speed advantage over the enemy and if the trigger is hold during a fight it will make your combos quicker and deadlier, this boost of course has a meter which can be replenished over time. You have another button that allows you to block an attack, this block lasts for a couple seconds since you can’t hold it, but it can maintain itself if the enemy has many consecutive strikes on you, if you succeed to parry you can counter with an EMP shot that stuns the enemy making him vulnerable to a long and strong combo. If you have a difficult time tracking multiple enemies, you can target one at a time with the other trigger making it easier to lock on a combo. As you land successful strikes your damage gauge fills up making you a more devastating fighter, remember that the enemy AI can get easily stun locked, the main combo is easy to land, basically can kill any robot minion even in a group, just be careful when encountering many as some have range abilities or shoot mines with a wide area of effect. The controller response does not feel like you would expect at first, but after getting to know the combat mechanics you can play through the missions very fluidly. Combos can feel a bit clunky while you press the buttons but it’s all a matter of getting used to the game’s speed. Also, the game doesn’t offer a wide variety of combos; it’s just you cleverly moving through the arena while mashing a correct sequence of buttons. Puzzle solving is fairly easy. Being a beat ‘em up game, you can simply defeat every enemy in a room and press a button(s) or collect a key to unlock a door. As you fight your way through, the game will progressively get harder with deadlier combinations of enemies after introducing tough ones on a 1v1 battle. Keeping track of the attack patterns is ‘key’ to win in this game as well as how fast you can bring a robot down. It’s all a matter of efficiency and optimization of your combos and the rest of your utilities, so react and execute wisely. The game isn’t punishing as it lets you start from a checkpoint even after a game over screen. Life orbs have a decent drop rate as well as 1Ups, for the most part. Bosses can be tricky as they can be a trial and error experience. Their damage is very high, you will meet your demise if you do not evade or parry correctly in two or even less occasions. They are fairly well designed and predictable, mostly by their dialogue lines, giving it a very oldschool feel to these fights. Character and world design is futuristic; color palette is limited due to this but graphically appealing to a certain point. 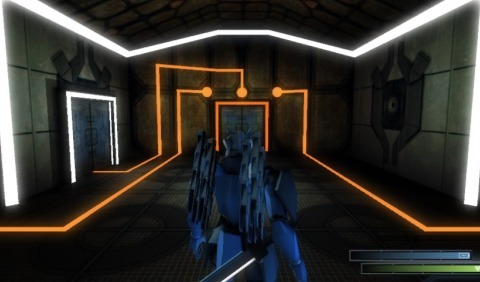 The scenarios work with many light sources and neon colors, the whole electronic ambience is well presented by this case. Dangerous encounters bring a red layer which works mostly to bring tension to a well-deserved battle. Overall, Proxy Blade Zero plays well, with fun combat, good visuals and an interesting music track; it compiles itself to meet the action beat ‘em up genre up to its standards. It is a game recommended for fans of this type and would invite new players to try it but be aware that the difficulty can scale quite a bit. + Good aesthetic visual style.